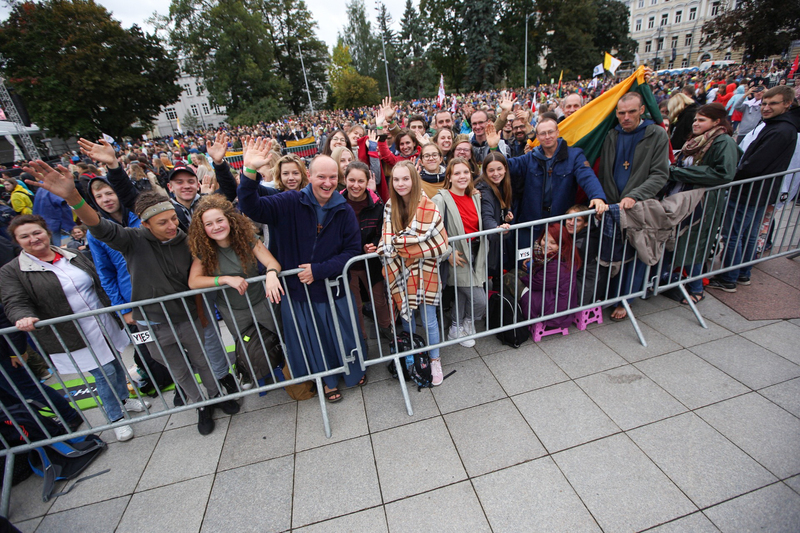 Young people have filled Cathedral Square and surrounding areas in Vilnius, Lithuania, to await an encounter with Pope Francis late this afternoon. Over the summer, some 30,000 free invitations for entry to the square itself were distributed by Internet. 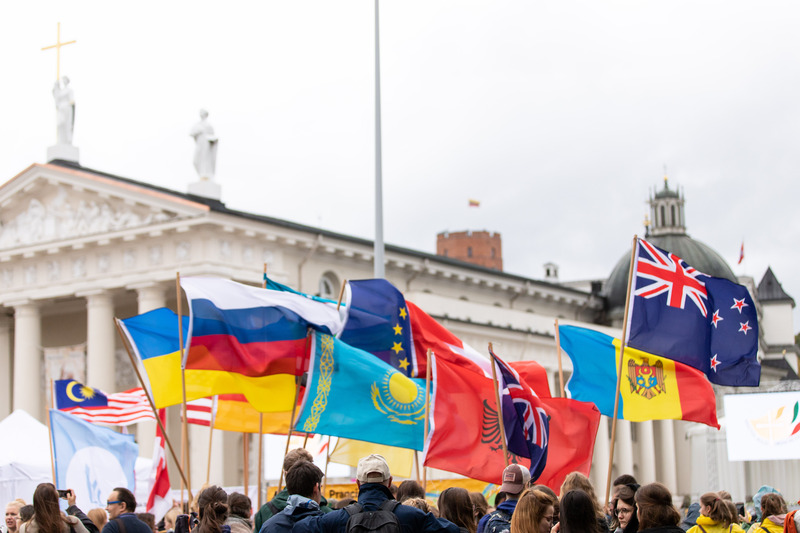 This is the only meeting with Catholic youth planned during the Pope’s visit to the three Baltic countries. Young people aged 14 to 35 make up 25% of Lithuania’s population of 2.9 million. Two stages have been set up in Cathedral Square. One is for the Holy Father and those accompanying him, the other for youth contributions. Decoration of the latter is dominated by votive offerings and flowers, which are signs of gratitude and prayer. On the stage prepared for the Pope, the original Image of Divine Mercy has been placed. It was painted in Vilnius in 1934 according to St. Faustina’s visions. The image is now well-known throughout the world. The meeting’s presenters are six young people: a priest, a nun, a dance teacher, a lawyer and two actors. The afternoon encounter is meant to be interesting and meaningful for a wide range of young people, from adolescents to college students to young families. While awaiting the Holy Father, four people will give personal testimonials. The topics of suicide and depression, family violence and addiction will all be touched on, as will matters of sexuality, self-esteem, the search for one’s identity, and bullying. Dancers and musicians will perform in reaction to the stories, thus complementing each testimonial artistically. At 15:00 local time, all those in Cathedral Square will join with the families and sick people gathered at the Gate of Dawn to pray the Chaplet of Divine Mercy. They will pray in five languages: Lithuanian, Polish, Latvian, Russian and English. Screens in the square will display a collage of the Image of Divine Mercy made of portraits sent by people from all over the world. 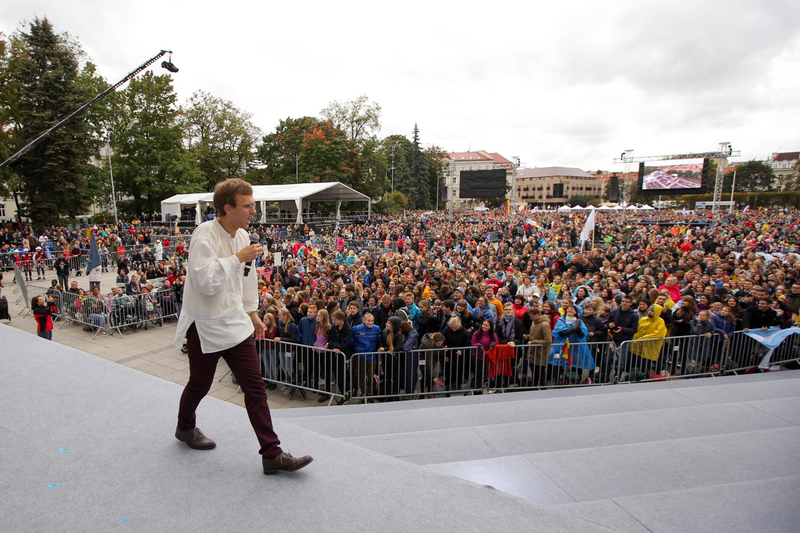 Vilnius, known as the City of Mercy due to its shrines and historical ties to the Divine Mercy and Our Lady of Mercy, today will thus implore the gift of Divine Mercy for all the world’s nations. Before his meeting with youth, Pope Francis will visit and pray at the Gate of Dawn Chapel of Our Lady of Mercy and then come by popemobile to Cathedral Square. After meeting with the young people, the Holy Father will go by popemobile from Vilnius Cathedral to the Apostolic Nunciature. Many people are expected to line the routes where the popemobile will pass.